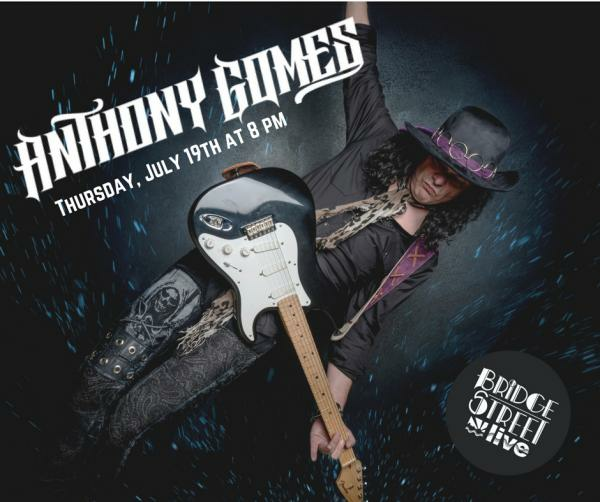 Blues rocker ANTHONY GOMES is back by popular demand on Thursday, July 19th at 8 pm! "Electric Field Holler," Anthony’s latest offering, is his most rock influenced album to date. The lead off track “Turn It Up” has Gomes rightfully boasting “I’ve got a blues soul and a rock n roll heart”. From the heavy hitting, guitar roaring “Back Door Scratching” to the mythic, autobiographical “Blueschild”, Gomes delivers a sensory roller coaster of instrumental, vocal and musical range. He sings with an integrity that exudes deep emotion, in the pulsing “Nowhere is Home” right through to the closing, apocalyptic “Listen To The Universe”. Blues Rock Review, Roots Music Report, Confessing The Blues and Blue Monday Monthly have featured Electric Field Holler in their Top Blues Albums of the Year, proving that Blues and Rock n Roll can not only co-exist, but the lines can be blurred between them to create a blazing cathartic experience radiating therapeutic heat for body and soul. Tickets are only $15 for General Admission and $25 for VIP Reserved (+ fees).